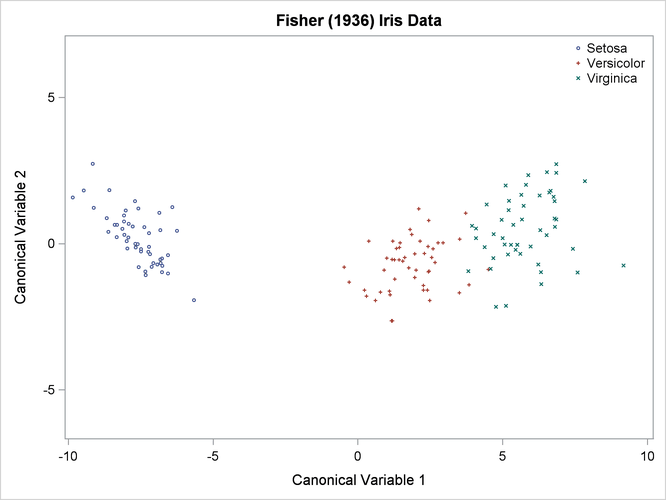 The iris data that were published by Fisher (1936) have been widely used for examples in discriminant analysis and cluster analysis. The sepal length, sepal width, petal length, and petal width are measured in millimeters in 50 iris specimens from each of three species: Iris setosa, I. versicolor, and I. virginica. The iris data set is available from the Sashelp library. This example is a canonical discriminant analysis that creates an output data set that contains scores on the canonical variables and plots the canonical variables. PROC CANDISC first displays information about the observations and the classes in the data set in Output 31.1.1. The DISTANCE option in the PROC CANDISC statement displays squared Mahalanobis distances between class means. Results from the DISTANCE option are shown in Output 31.1.2. Output 31.1.3 displays univariate and multivariate statistics. The ANOVA option uses univariate statistics to test the hypothesis that the class means are equal. The resulting R-square values range from 0.4008 for SepalWidth to 0.9414 for PetalLength, and each variable is significant at the 0.0001 level. The multivariate test for differences between the classes (which is displayed by default) is also significant at the 0.0001 level; you would expect this from the highly significant univariate test results. Output 31.1.4 displays canonical correlations and eigenvalues. The R square between Can1 and the CLASS variable, 0.969872, is much larger than the corresponding R square for Can2, 0.222027. Output 31.1.5 displays correlations between canonical and original variables. Output 31.1.6 displays canonical coefficients. The raw canonical coefficients for the first canonical variable, Can1, show that the classes differ most widely on the linear combination of the centered variables: . Output 31.1.7 displays class level means on canonical variables. The plot of canonical variables in Output 31.1.8 shows that of the two canonical variables, Can1 has more discriminatory power.